Whenever I dig into what's in the kids closets, I often find that half of what is in there is now too small for them to wear- and the other half is a mixture of items that fit and are “good to go” for school, and pieces that are just too worn out and need to be replaced! By mid-August, I am just itching to get into these closets with the kids and start having them try things on and sort through items with me! 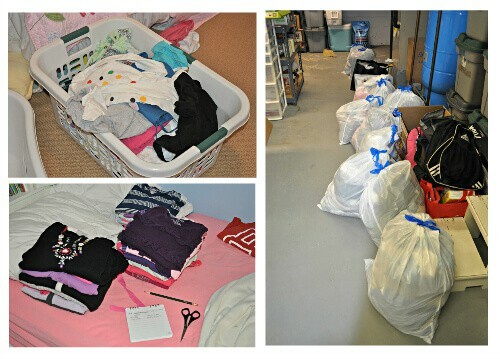 Here's how I get my large family ready for the new school year, and how to organize the kids closets for back to school! It is easiest to start cleaning out a closet (dresser, etc.) when some of the items are already removed. So I prefer to do a week's worth of laundry, sort the clean clothes into baskets, and then wait to put them away until after I've gone through everything that is remaining in the closet. That way when you pull out half of his stuff to hand down to his younger brother, you can have that basket of clothes to work with when organizing the younger brother's closet. Start at the top shelf and then work your way down to the bottom shelf- moving from the left to the right. Pick up every single item that you find on each shelf or drawer and decide whether it stays or goes. Sort through your items. If it fits, fold it neatly and return it to its proper shelf. If it is outgrown but can be worn by a sibling, the put it into a laundry basket to be taken to that sibling's side of the closet. 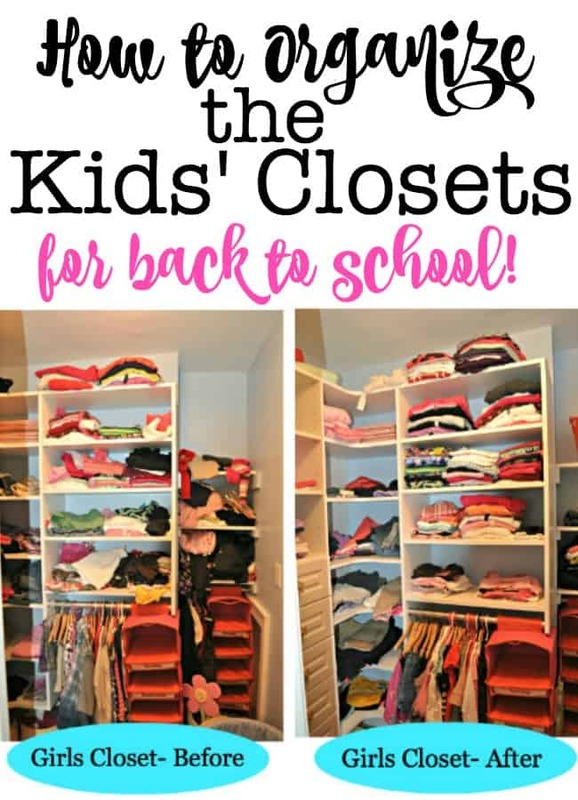 Once you have sorted through the entire contents of the closet and added in items that trickled down from larger siblings closets (or items from friends who were kind enough to drop off their kids outgrown clothing!) and put away the newly washed items as well, it's time to assess what you still need to kick off the school year. I make sure that my kids have enough shorts, tees, and warm weather clothing- because it will still be in the 70's and 80's during Sept and early October. But I do ask my kids to try on a pair of their pants or jeans and a long sleeve shirt so that I can see if we will need the next size up once fall weather arrives. I can then add those items that I need to buy to a list, and be ready to pounce once these items are on sale at the Gap and Old Navy! And don't forget “special” items that you'll need during the year- like say a white button-down shirt and black pants for band concerts. I can tell you from experience that they are much easier to find this time of year when stores are pushing their “uniform” items- and many of the stores already have these on sale. But if you wait until say the spring band concert, they will be impossible to find! « Great Birthday Party Idea for An 8-Year Old Girl: A Cupcake Wars Birthday Party! This is my least favorite parenting job! My kids are still pretty little, so I am reorganizing clothes almost every season because they outgrow things so fast! Thanks for the tips!